Nam Jim or Nam Chim is Thai for "Dipping Sauce". 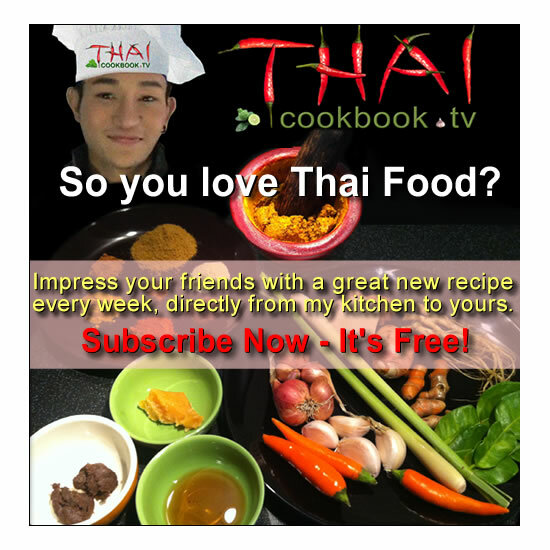 It's a generic term that can refer to many different kinds of dipping sauces in Thai cuisine. Most are a combination of spicy, salty, sweet, and sour flavors. This sweet and spicy version is commonly called Nam Jim Gai, or Dipping Sauce for Chicken, although it can be seen served on the side with many kinds of meats and snack foods. 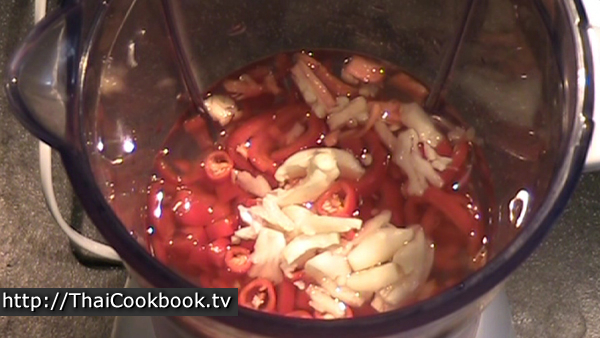 It can also be used as an ingredient in other recipes to add a hint of spicy and sweet. We use Thai Long Chilies to get this wonderful color, then just a little Thai Hot Chili to get the spicy flavor. You can adjust the ratio of hot to mild chilies according to your own tastes. 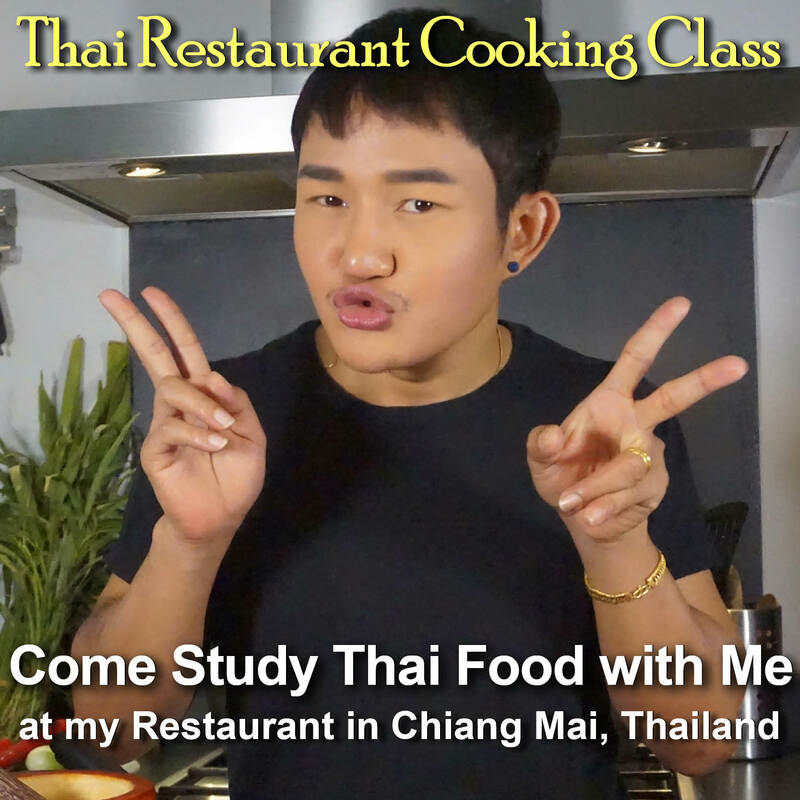 The fresh ingredients in nam chim can be finely chopped or pounded in a mortar and pestle, but you can easily use a blender or food processor to make this delicious traditional Thai dipping sauce. What's in our Sweet Chili Dipping Sauce. 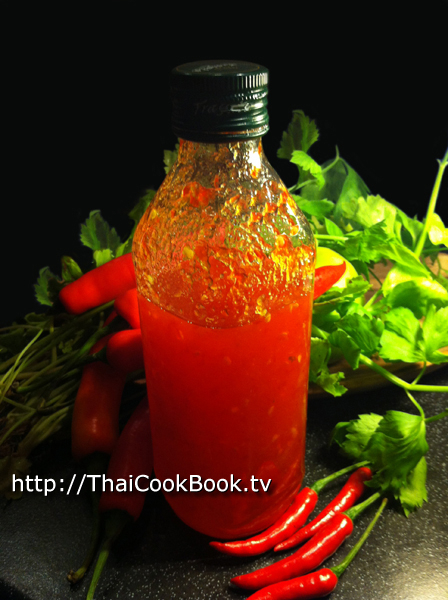 How we make our Sweet Chili Dipping Sauce. 1) Put everything into a blender and pulse / blend until the chilies and garlic are well chopped and the mixture is a little frothy. 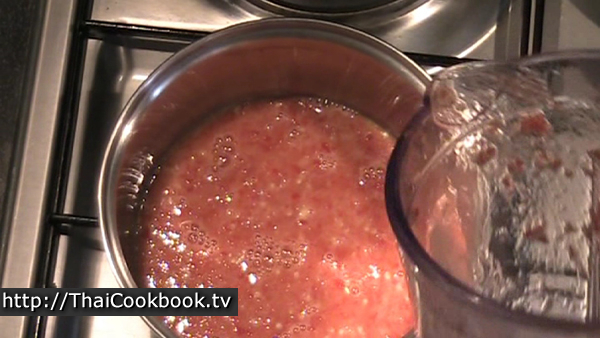 2) Pour it all into a saucepan or small pot. Heat over a medium - high flame, stirring often to be sure it doesn't stick or burn. 3) Let it come to a good boil for just a bit, then turn down the heat so it's barely bubbling. 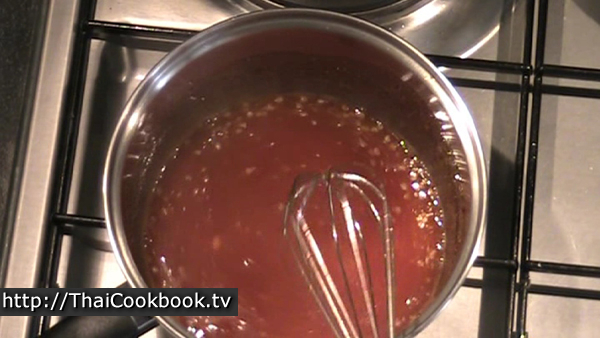 4) Cook like this until it starts thicken just a little, for about 10 - 15 minutes, stirring often. Let cool then transfer to a jar with a lid. Store in the refrigerator. 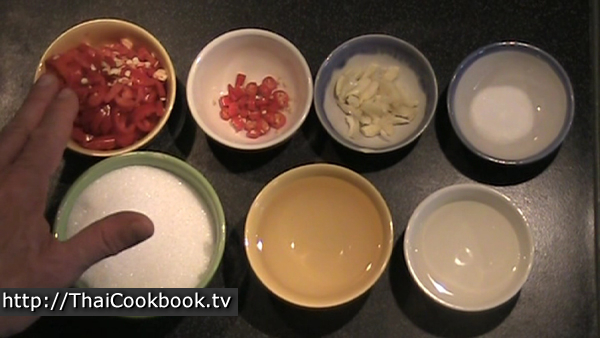 Assemble all the ingredients, cutting the chilies and garlic into small pieces. Put everything into a blender and pulse / blend until the chilies and garlic are well chopped and the mixture is a little frothy. Pour it all into a saucepan or small pot. Heat over a medium - high flame, stirring often to be sure it doesn't stick or burn. You'll notice that all the chili and garlic is floating. Let it come to a good boil for just a bit, then turn down the heat so it's barely bubbling. 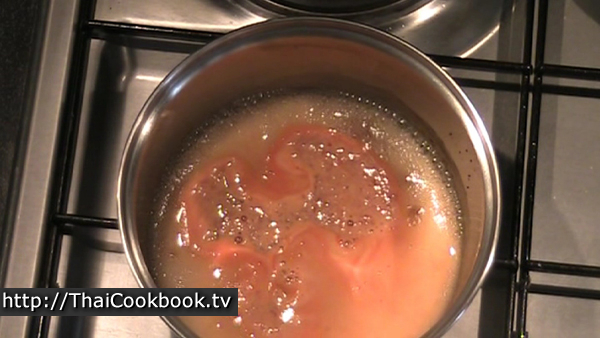 Cook like this until it starts thicken just a little, for about 10 - 15 minutes, stirring often. You'll know it ready when most of the chili and garlic pieces are suspended within the sauce, rather than all floating on top. Be careful not to overcook it. This sauce should be a little watery, and just thick enough to stick to whatever you're dipping into it. 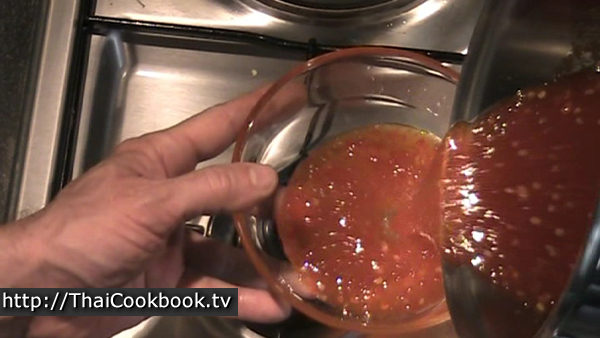 Remove the pan from the heat, and allow the mixture to cool. Later you can transfer it to a bowl or jar. Store in your refrigerator. It will keep for several months. This Nam Jim is much more than a delicious dipping sauce, we use it as an ingredient in other recipes to add a hint of sweet and spicy flavor.